The next time you skip brushing your teeth before going to bed, make sure you're not using the Beam Brush. 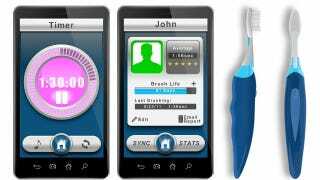 It tracks your dental hygiene habits with a Bluetooth connection to your smartphone, reminding you of your negligence. The first version of the toothbrush, which is promised sometime next month for around $50, will simply keep track of how long you've been brushing, using a sensor that knows when it's actually being used to scrub your teeth. The accompanying iOS and Android apps will also provide visual timers, letting you know when you've brushed for the recommended two minutes. Future versions of the brush will be even more intelligent, with the ability to specifically keep track of what areas of your mouth have been brushed, and reminding you which areas require more attention. Its creators have even been tossing around the idea of the app gaining a reward or incentive system to encourage kids to brush up.